“Real Food” recognizes that our food system should be inclusive and nourishing for consumers, producers, our communities and our earth. The idea of “Real Food” is beyond “local” or “green” or “slow” food. It is a culmination of all of these ideas into one holistic term. If a piece of food is community based, ecologically sound, humanely raised, and/or fairly traded, it can be deemed “Real Food. By signing the Real Food Campus Commitment in 2013, UMass Dining has pledged to source at least 20% real food annually by the year 2020. 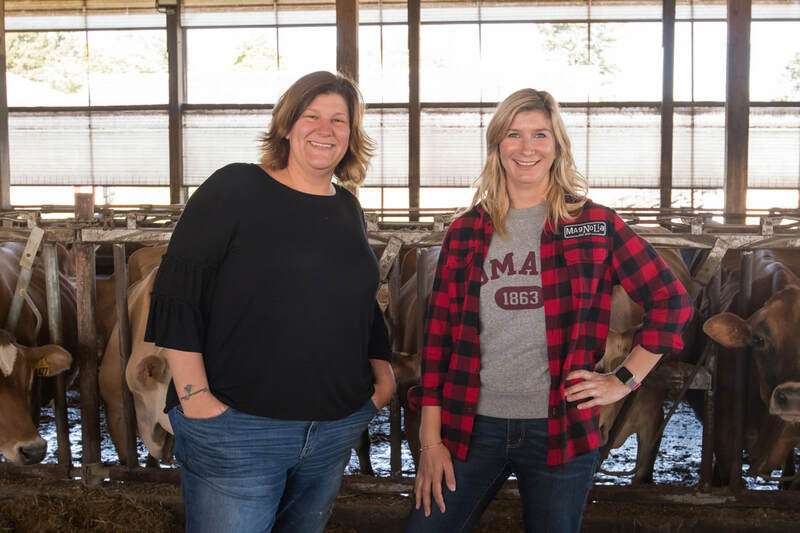 Through the Real Food Challenge, UMass Dining hopes to use our tremendous purchasing power to support a healthy food system that strengthens local economies, respects the rights of humans and animals, ensures ecological sustainability, and facilitates community involvement and education. ​UMass Amherst is on track to achieve its target of 20% real food by 2020. As of FY15, we are sourcing nearly 13.5% Real Food. 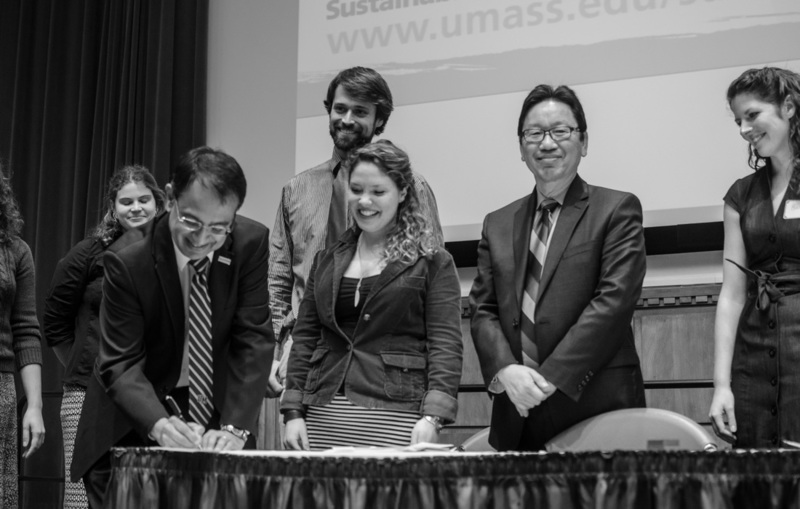 Chancellor Subbaswamy signs UMass Amherst onto the Real Food Campus Commitment at Campus Sustainability Day in 2013. Real Food truly nourishes producers, consumers, communities, and the earth at all levels of the food chain. We aim to source food for our dining services that is fair, humane, community-based, and ecologically sound. Local and community-based foods can be traced to nearby farms and businesses that are locally owned and operated. Sourcing these foods supports the local economy by keeping money in the community and building relationships. The food travels fewer miles to reach consumers, is seasonal, and when it is fresh, often has a higher nutrient content. Fair food means that the individuals involved in food production, distribution, preparation etc., work in safe and fair conditions, receive a living wage, are ensured the right to organize, the right to a grievance process, and have equal opportunity for employment. Fair food builds community capacity and ensures and promotes socially-just practices in the food system. 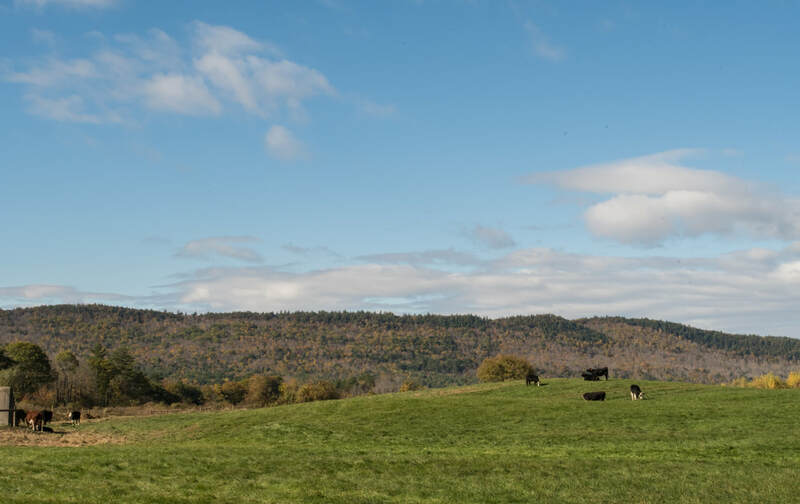 Ecologically sound farms, businesses, and other operations involved with food production practice environmental stewardship that conserves biodiversity and preserves natural resources, including energy, wildlife, water, air, and soil. Production practices should minimize toxic substances as well as direct and indirect petroleum inputs. 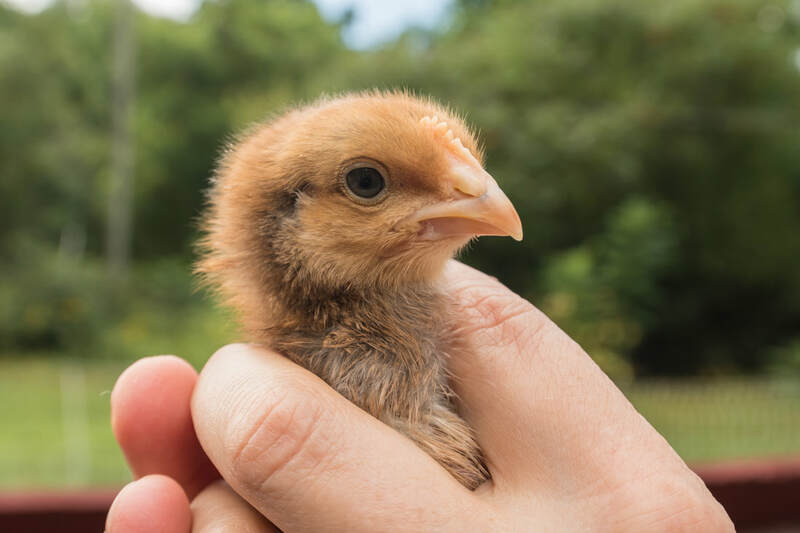 For food to be considered humane, animals must be able to express natural behavior in a low-stress environment and are raised without hormones or unnecessary medication. To ensure the highest quality of Real Food, third party certifications independent of the purchasing institution and the provider must be acquired. 1. Increasing Local Dairy - All bulk milk in Franklin DC is now sourced locally from Mapleline Farm. This will mean that three of our four Dining Commons will be sourcing all local milk. Three of our four dining commons now serve all local dairy. 2. 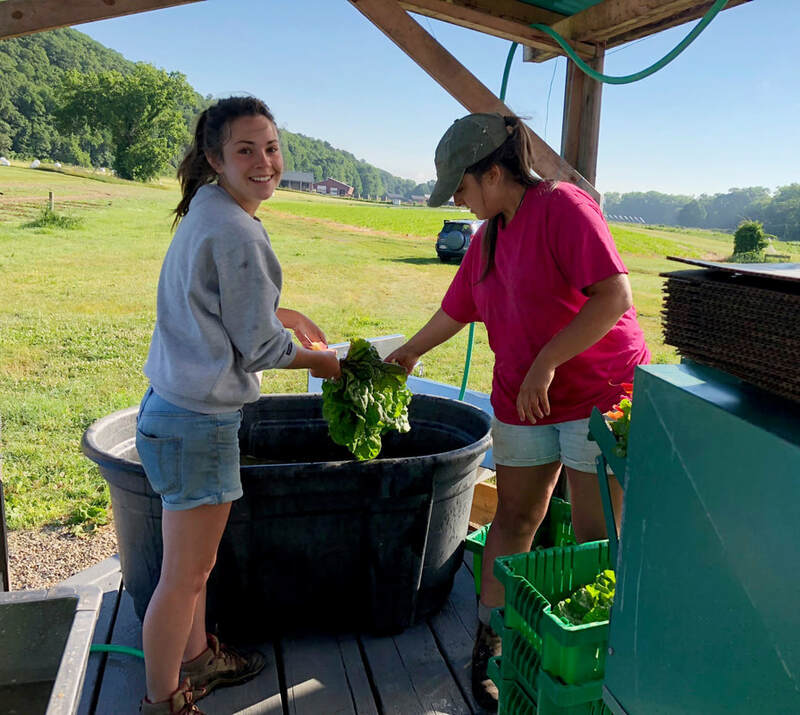 Increasing Local Greens - This year we increased purchasing of romaine, collards, cilantro, arugula, and rainbow chard for the DCs from Atlas Farm and Queen's Greens while in season. Once the season ends, we will sourcing from FreshPoint, who sends us regional products first, when available. 3. Pursuing Hydroponic Greens for Year-Round Use - We are hoping to continue to work with Little Leaf Farm and other local hydroponic sources in the future to provide us with local greens in the off-season. 4. Increasing Local Poultry - Our goal is to double our local poultry sourcing to 12% by the year 2020. We recently began working with Reed Farm (formerly Valley Poultry), buying 200 birds/week this Fall, to work towards this goal. We are also hosting Poultry Gatherings to increase and improve the local poultry industry by working closely with producers, policy makers, non-profits, and other buyers to identify problems and create solutions. 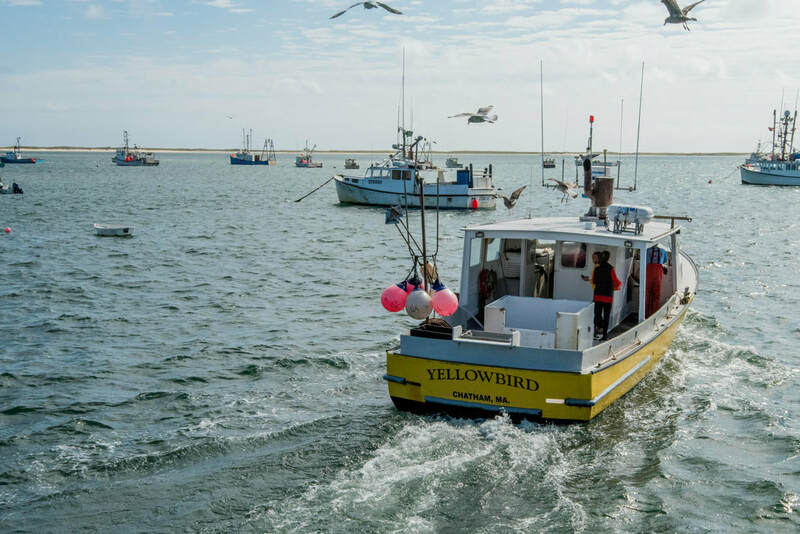 For more information about our sourcing practices, visit our Purchasing page.